For the next 12 days, VSTBuzz offers 50% off AcousticSamples' Sunbird virtual acoustic guitar for UVI Workstation. MusicLab has released version 4 of its sample-based virtual instrument Realguitar. Applied Acoustics Systems announces the availability of the electric guitar set update for its Strum GS-2 plug-in. Orange Tree Samples announces an update for its Evolution Acoustic Guitar - Steel Strings instrument for Kontakt. 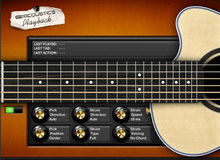 Applied Acoustics Systems has released a new version of its acoustic guitar plug-in for Mac OS X and Windows. In Session Audio announced the release of its Fingerstyle Folk Acoustic Guitar multiformat loop library with a special introductory price. Modwheel introduces a new sample library for Kontakt cooked from a biscuit tin guitar. Ample Guitar released version 2.0 for its three virtual Martin, Taylor and Alhambra acoustic guitars.